As some of you may have heard, Bryce Harper is entering the last year with the Nationals before he has the ability to test free agency. And one can infer that his decision will have a great impact on how the Nationals decide to shape their roster in 2019 and beyond. 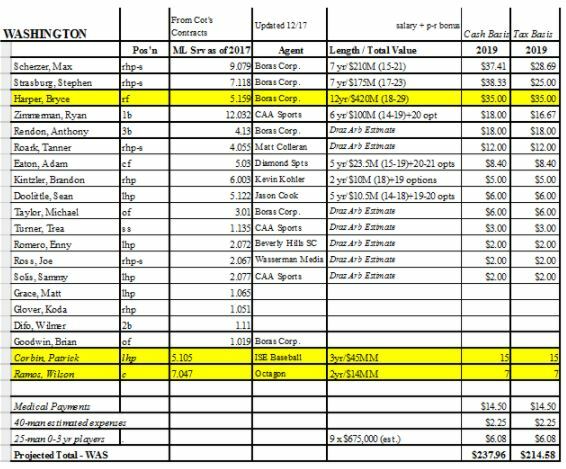 Going into 2018, the Nationals appear poised to exceed the $197,000,000 luxury tax figure. 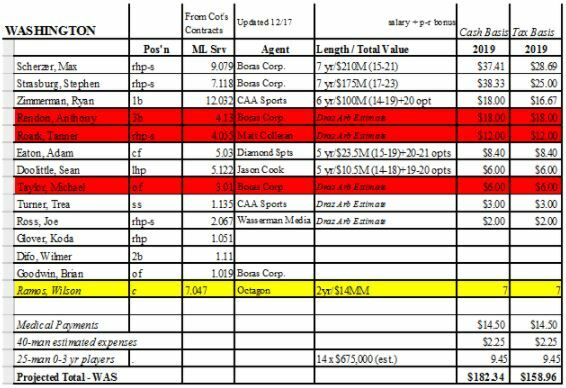 After the Matt Adams and Brandon Kintzler signings, Cot’s Baseball Contracts projects the Nats will be spending $195,017,456 on a cash basis, but $201,483,976 on a tax basis ($4.5MM over the cap). The main differences are Max Scherzer ($28.7MM against the cap, but $22.1MM in cash) and Stephen Strasburg ($25.0MM against the cap, but $18.3MM in cash). We will see that this imbalance goes the other direction in 2019 when Max is paid $37.4MM and Stras is paid $38.3MM in cash (Holy moley!). Here is a current look on a cash basis of the 2018 Nationals payroll (from Cot’s). Note that I have omitted any pre-arbitration players from 2018-2020 such as Victor Robles. 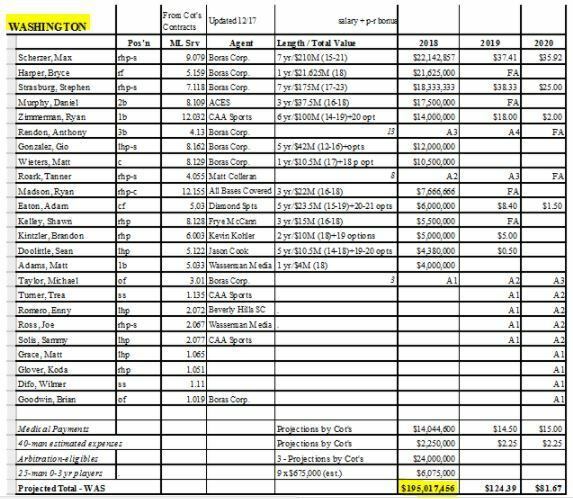 While it appears that the Nationals only have $124MM of committed payroll in 2019, that does not include players such as Rendon and Roark who will receive arbitration salaries and who are highly unlikely to be released prior to free agency. 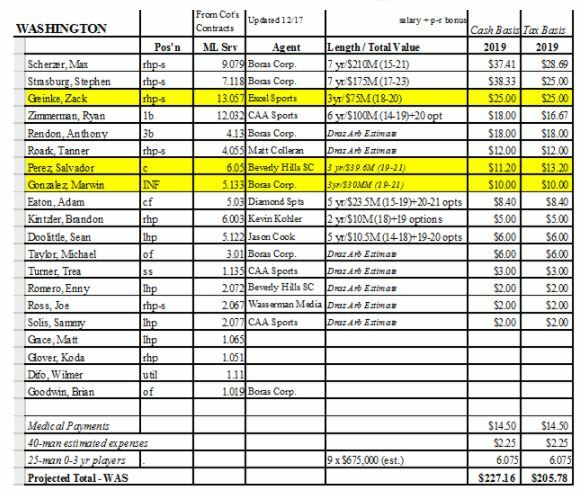 The following is my best guess of the likely cash and tax payroll given arbitration awards for 2019 prior to re-signing Harper, Murphy, Gonzalez, Wieters, Madson, etc or signing/trading for any new players. Note on a cash basis, there is a lot of salary due, but for the 2019 cap (which rises to $206,000,000), the Nats do have nearly $50MM of cushion before facing a penalty. One would assume that if the Nationals do sign Bryce Harper, they will also choose to replace some of their other free agents with decent players and will be forced to spend at or above the luxury tax level. For this scenario, I have projected that Harper will resign for 12 years @ $35MM/yr and that will be paid on a straight-line basis. 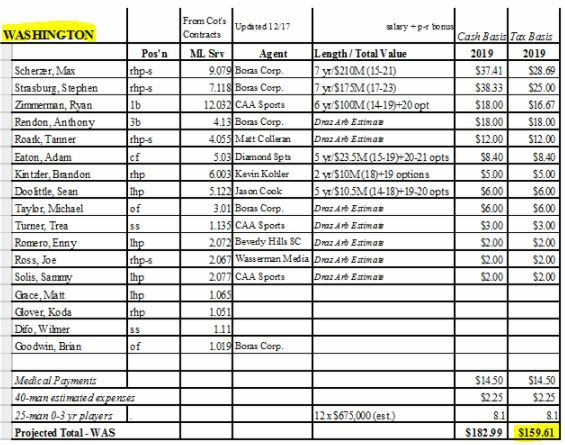 This high salary, however, led me to be hard-pressed to think that the Nationals could afford significant upgrades to their roster and I projected the team to sign Wilson Ramos and Patrick Corbin as free agents. They would likely have to play Difo at second base and rely more heavily on pre-arb bullpen pieces. In the below “With Harper” projection, I have assumed only 9 Pre-arb guys on the roster, but that could easily jump by releasing guys such as Enny Romero, Sammy Solis, and Brandon Kintzler to massage their payroll. Still, in the “With Harper” scenario, the cash payroll soars to $238MM and the tax payroll is $215MM (PLEASE settle the MASN dispute in our favor quickly!!!). Sadly, Bryce Harper may choose to sign with the Yankees, Cubs, Dodgers, (or perhaps even switch sports to go play for his beloved Vegas Golden Knights) and leave us sad Nationals fans behind. The Nationals would then have to decide whether to compete behind stars such as Max, Stras, Tony Two Bags, Trea, and Robles, or perhaps do a retool/rebuild. Should Harper’s rejection send Rizzo and Lerner into a tizzy and make them want to retool rather than compete in 2019, presumably that would mean a fairly significant reduction of payroll. In this final scenario, I assume the team would decline the option for Brandon Kintzler, No Arb for Enny Romero and Sammy Solis, drop Matt Grace, and perhaps look to trade Rendon, Roark, and Taylor (all getting expensive in arbitration) for prospects to rebuild. I’ve assumed we would still need a catcher, so I’ve projected resigning a veteran catcher like Wilson Ramos, but this scenario drops the team to at least $50MM below the cap and potentially as much as $85MM below the cap if they traded their stars in their last years. In this scenario, the Nationals would be playing with 14-17 pre-arb guys! Frankly, with Strasburg, Scherzer, Turner, Robles, and Zimmerman, the team could possibly still compete for a wild card, but it would definitely be a large step back. The numbers suggest that Rizzo and the Lerners will be facing some tough decisions whether or not Mr. Harper decides to re-sign. What direction do you suspect the team will go in 2019? For full access to the payroll spreadsheets, they are viewable at https://docs.google.com/spreadsheets/d/1Q_nvAuZk9Loo2URCVGDwMQdIsaPmFMvN1dH-uKe0kJw/edit?usp=sharing. This entry was posted in Analysis, Harper, Lerners, MikeRizzo. Bookmark the permalink.